Art Villa Nautilus i Tenerife, Spanien: Reservér nu! Art Villa Nautilus is a real villa upgraded into a 4 bedroom luxury hostel with a cozy green garden in front of the house on the shaded side and a large back yard with sun beds, grill and fruit trees. We have mountain bicycles the guests can rent. And we offer assistance with booking most activities on the island (exp. Rent a car or book a jet ski safari). Come to enjoy with us the very best of Arona and Canary Islands. 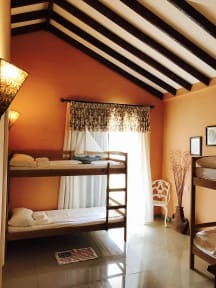 Art Villa Nautilus is a luxury hostel that is situated in a very green and quite area 5 minute’s walk away from the beach and a 10 min walk to all the shops, bars and restaurants. To be more exact, we are located near to some of the best landmarks of the town of Costa del Silencio such as Parque De Garañaña and Marina del Sur Tenerife. Puerto de Las Galletas amongst other interesting places of our area. In addition, the Mountain of Teide and Santa Cruz de Tenerife are around one hour away by car, so both points can be reached easily by car from our facilities. We have several types of rooms to satisfy several sort of clients. 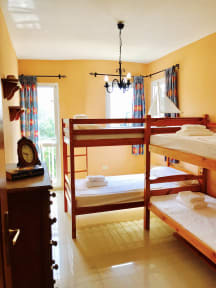 In this sense, we have several dorms for four people that will suit the necessities of the most venturesome travellers who are looking for adventures and sun in the Canary Island. Meanwhile, for those who are looking for a more relaxing experience, we offer a twin room ideal for couples or friends. There is a party terrace on the” neighbor less” side of the house, where you don't have to worry about being too loud. There are altogether 4 lounge and social areas plus the kitchen and the hall. In addition, there is a friendly multi-lingual administrator at the hostel 24/7 to make sure you have all you need and to answer all your questions. Bicycles and sports gear can be rented on the spot as well as reservation of all the touristic activities Tenerife has to offer (ex. Diving, Hiking, Cycling, Surfing, Snorkeling, Quad safari etc.) with no extra charge can be done on the spot. So come see us at the Nautilus Hostel for unforgetable experience!